Fredericksburg Day 2! Y’all it was, yes, another wonderful day in the Texas Hill Country. 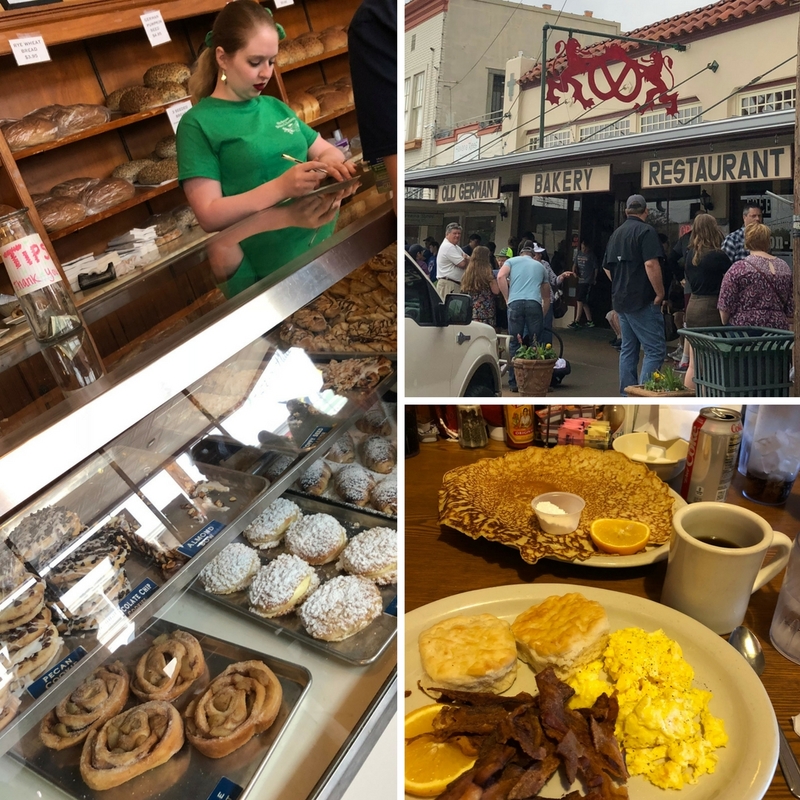 Ok pause, if you missed Day 1… stop and click here to read all of the fun we had on the drive to Fredericksburg and our big night in Luckenbach, TX. We couldn’t have asked for better weather for our girls weekend in the Texas Hill Country. 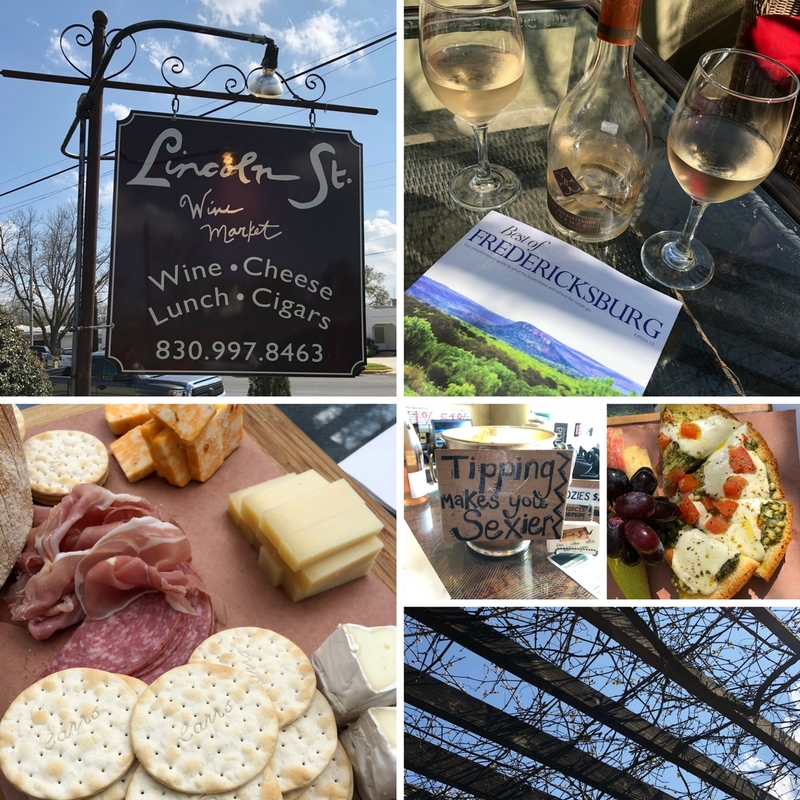 With clear blue skies and rolling hills on the horizon, the day was picture perfect for a Saturday packed with wine tours and a lazy afternoon patio hopping. Y’all I could seriously get use to the Texas Hill Country life… Let’s just say Monday back in the office after this girls weekend was a struggle. We kicked off our day on Main Street at the Old German Bakery and Restaurant. The pictures really don’t do the pastries justice. The good ole saying “your eyes are bigger than your stomach” rang true as soon as we walked through the doors of the bakery. Not only did we order food that barely fit on the table, we had do grab sausage wraps and pastries to go. Our waitress thought we were nuts, but totally worth the carb overload. The must haves for this dinning experience were the waffle (only a 1/2), the potato and German pancakes. 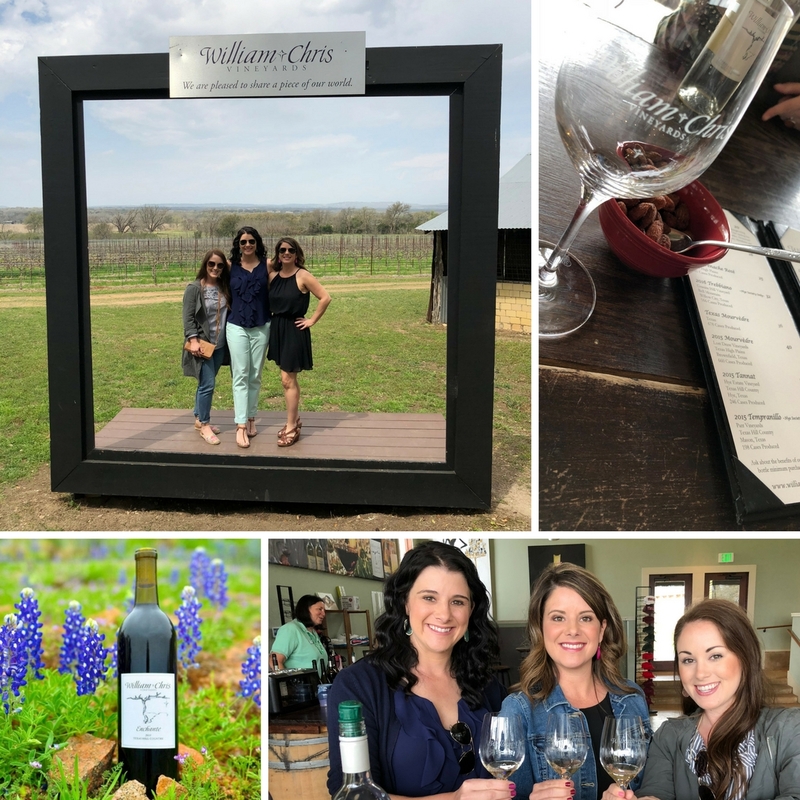 Our carb overload didn’t slow us down one bit, we called Uber and made our way to William Chris Vineyards in Hye, Texas…just outside of Fredericksburg. And yes, I said UBER. Just as a side note, Uber has expanded into Fredericksburg. They began this December and we used the heck out of the app over the weekend. I will say that Uber was really great for in town requests, the farther we got away from town the more challenging it was to actually get a ride. Next time we plan to use our friend Rex at the 19th hole Wine Tours , he actually saved us when Uber stranded us at William Chris Winery. Ok ya’ll back to the important topic…wine. William Chris Vineyards was picture perfect and a great way to kick off our wine tour. The tasting room was divided by six bars where guests were paired with their William Chris customer experience representative to taste each wine. A list of wines were provided to you for the tasting along with a small bowl of almonds, with a little bit of kick, to cleanse your pallet between tasting the wine. After our delightful tasting, we enjoyed sitting out on the lawn, people watching, and listening to live music. Quick tip…they take their reservations very seriously, so please make sure and go to their website to register before just showing up for a tasting! William Chris Vineyard (10352 U.S. Highway 290, Hye, TX 78635). Bluebonnet Photo Credit: William Chris Vineyard website. 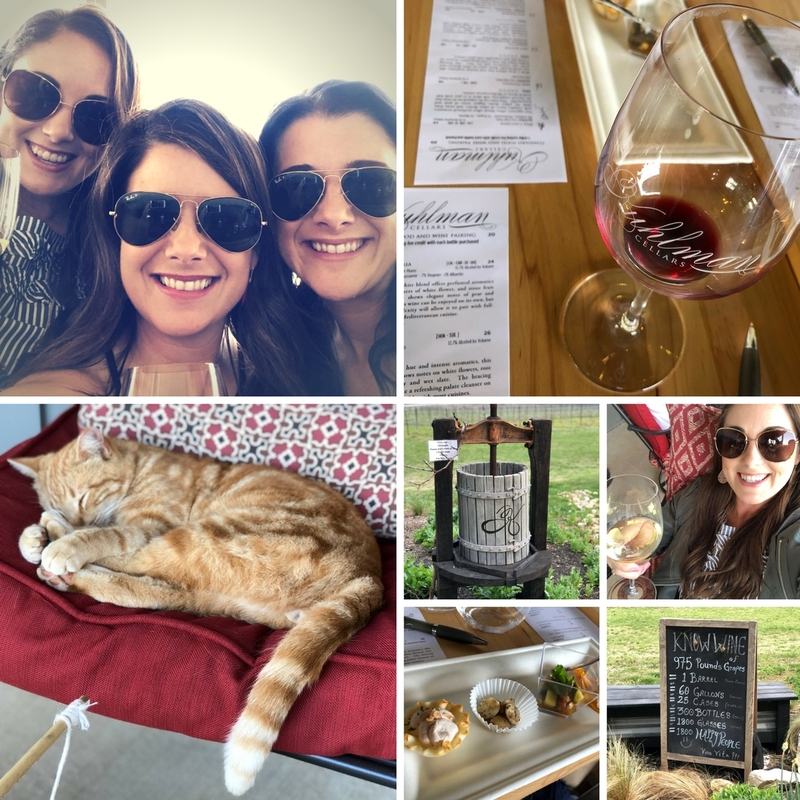 After hitching a ride with our new friend Rex at 19th hole Wine Tours, we headed over to Kuhlman Cellars… and I hate to be biased y’all, but this was by far my favorite tour. What made the experience for me, at Kuhlman Cellars, was the outstanding customer service and attention to detail. Not only was the atmosphere amazing, the staff was beyond knowledgeable about their product. I really enjoy learning about wine, and more specifically how it pairs with food. I think it’s great to hear where the grape comes from and how it grows, but what I really want to know is … “does this go with steak and potatoes?” Kulhman Cellars did just that, they provided gourmet bite size bundles of flavor that paired with each wine. Our tasting guide was excellent in explaining how the flavors of the wine would change in each bite of our food. If you do nothing else please stop by and buy a jar of their herbed almonds, I could eat these by the truck load. After a great experience in the tasting room we decided to test out the porch where we fell in love with their orange tabby cat and the cozy patio furniture. I recommend also making a reservation at Kulhman Cellars, unless you just plan to just buy a glass of wine and enjoy the patio experience. Keeping up with our patio hopping theme for the day, we made our way back into town to sip Rose at Lincoln Street Wine Market. We indulged in an afternoon snack, inclusive of a custom gourmet cheese tray and margarita pizza. Live music and the faint smell of cigars filled the patio as we relaxed, laughed and simply enjoyed life in the slow lane. Y’all, don’t let our jam packed day fool you, the best part about our vacation were the afternoon naps to recharge for each evening. After a break and some much needed relaxing time we felt renewed and ready to take on the night! We found ourselves at The Treaty House, known for their cocktails and shareable dishes. 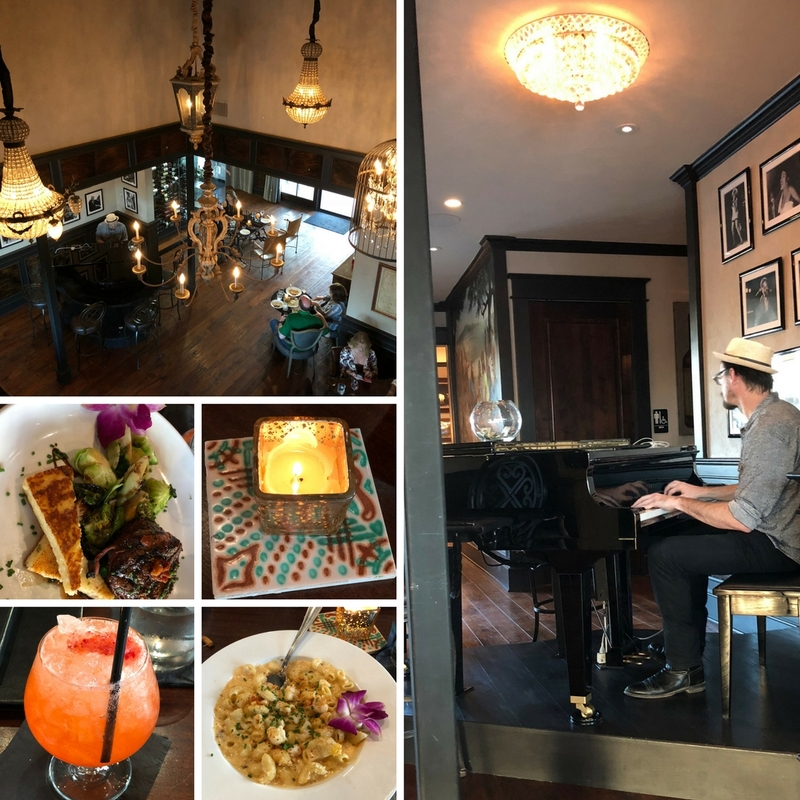 The food was amazing and the atmosphere almost topped that with a piano playing in the background and vocalist singing his little heart out. The Treaty House was a great experience and a good place to hangout for the evening with no pressure to leave. PS y’all, get the crab mac and cheese … your stomach will thank you later. Day 2 complete! 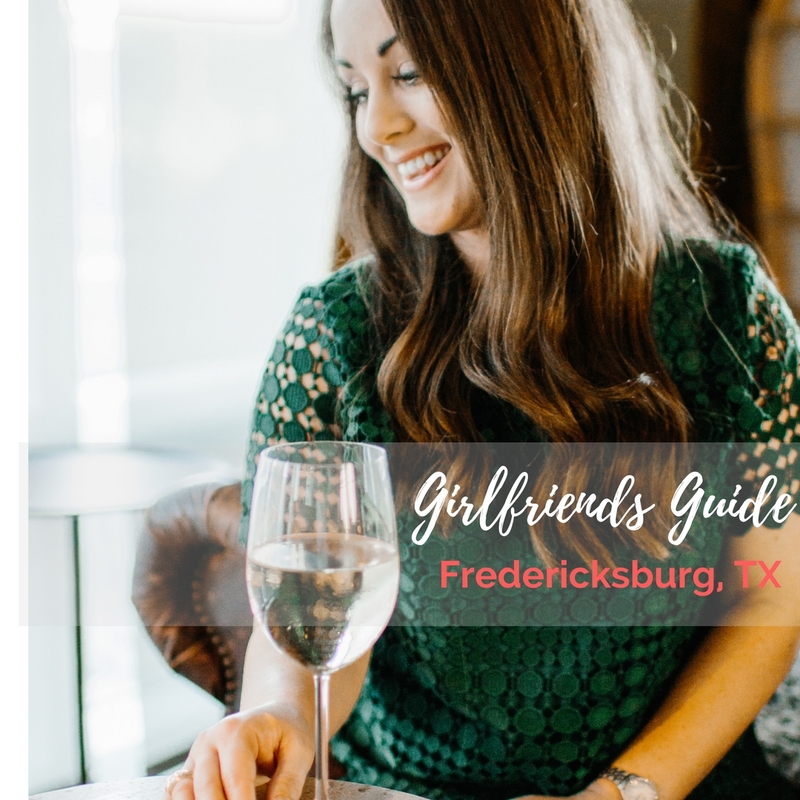 When planning your Texas Hill Country vacation keep in mind that you will need reservations at the wineries and at the higher end restaurants. Also consider your transportation… ok putting my “mom hat” on here, please utilize Uber or local businesses like Rex’s 19th hole Wine Tours for safe transportation. Also take naps, it’s ok to take naps on vacations, in fact it’s highly encouraged. Y’all, stay tuned for a recap of Day 3, full of shopping and more food! I will also tell you how to fit in a few more wineries when you are short on time!